Bookclub preidents Meet Ella at Capital BookFest to receive gift bags of review books! Let us help you select your next book of the month. We have several awesome books for your club to preview and to review. Look for the EDC logo on the table. Pastor Jamal Bryant. Marita Golden. Omar Tyree. Shane Evans. E. Ethelbert Miller. Tim Reid. Charisse Nunes. Liza Mundy. Connie Briscoe. Victoria Christopher Murray. These are just a few of the amazing authors who will participate in the fifth annual Capital BookFest. The popular, family-oriented Capital BookFest returns to the National Capital area this year on Saturday, October 3, 2009. Festivities are spread among four different zones in and around the Borders Books and Café, 931A Capital Centre Blvd, inside The Blvd at Capital Centre Mall in Largo, Maryland. The fun starts at 10:00 a.m. and lasts all day until 7:00 p.m. In addition, and in response to President Obama’s call to service, the Capital BookFest and the Prince George’s County Department of Social Services partner up to promote healthy homes for children in foster care. The fifth annual Capital BookFest, presented in partnership with the Maryland National Capital Parks and Planning Commission, features author readings/signings, teen authors and programs, poetry, exhibitors, children’s storytelling, writers’ and publishers’ workshops, and discussion forums for parents and children alike. The first 1000 early birds even receive book giveaways! “…the Capital BookFest was born out of this desire to motivate and educate parents and children to enjoy a good book…together”, states Kwame Alexander, award-winning producer, publisher, poet, and co-creator of the annual BookFest. Hence the mission: Strengthen Families through Reading. Please go to the Capital BookFest website www.capitalbookfest.org for more information about the festival, including the list of authors, exhibitors, forums, and the proposed schedule of events. 11:00 am – 6:30 pm Ella Curry of EDC Creations has Intimate Conversations Interviews with featured authors. I sometimes wonder if many of us are living in a fragile little bubble, so caught up in our own lives that we fail to realize what’s really going on around us. Our kids are killing one another at an alarming rate, but some of us only seem to care when it’s one of our own who are victimized. Many of our communities are becoming dangerous wastelands, compelling the vast majority of us to strive to move out and never look back. I wonder, does that make us any better than those Caucasians who vacate a community as soon as a minority family moves in? Countless school districts (partly) responsible for educating our children are inadequate, but what do we do? Most do nothing. A few complain and blame the overburdened teachers, while some others who can afford it go the private school route. I wonder how many of us recognize a need and educate our own children at home, sacrificing our own time and energy to ensure their success? How many of us mentor a child who isn’t our own but has a need for guidance, in order to give someone else a chance at success? Many parents today don’t know the first thing about raising a child. 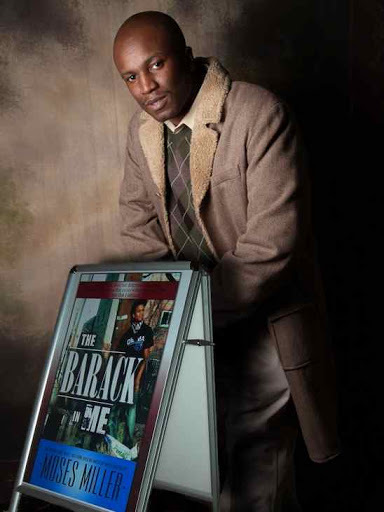 A lady told me the other day that she wouldn’t be able to get her son to put down his videogames long enough to read my book, The Barack in Me. Meanwhile, when she was talking to me, she was clutching a Game Stop bag in her hand, with more videogames tucked inside. Who’s the parent? Who’s determining what’s vital in your young child’s development? Derrion Albert was an honor student who was murdered for no reason whatsoever, by four children. These four children will undoubtedly get charged as men and spend a good portion of their lives rotting away in prison like so many other African American boys. However, between now and when (not if) the next Derrion Albert is killed, we need to honestly ask ourselves some questions. What are we doing to keep our own children safe? Are we playing an active role in their development? Are we willing to be hard on them if it is for their own good, or do we defer to them when a tough decision has to be made? Also, are we actively engaging other children and young adults who desperately need our guidance? Our communities were once built on the concept that it takes a village to raise a child. Where’s the village? Where are the leaders? As a matter of fact, where are the black owned businesses in our neighborhoods-another issue altogether, but a burdening concern nonetheless. Hopefully none of our children will be impacted by violence brought upon them by a child who belonged to someone else. Hopefully none of us will ever have to wonder what we could have done differently, what we could have said, or what more we should have done? Five lives ended on the day Derrion Albert was killed. One was lost involuntarily. Four other misguided children figuratively committed suicide that day as well, when they took his life. Sure, they will live on, but trust me, their lives are over. Where were their parents? Where were their advocates and mentors when they needed them? Hopefully the day will never come when we’re sitting in a room teary-eyed asking these same questions and receiving no response. The unfortunate reality is that unless we figure out a way to restore our village through hard work and commitment on all of our parts, one or more of us may be faced with the same pain Derrion’s loved ones are undoubtedly plagued with now. A child’s life taken by the child of someone else. When will we realize that they’re all our children? When will more of us step up and play our part in helping to mentor and guide them all? Today more than ever, it takes a village to raise a child. Please, stop living in a bubble. Moses Miller Mind Candy, LLC. $10.99–Two Copies For The Price of One!!!!! I’m sure like most book clubs, your club is into reading fiction. But as lovers of the written word, I wanted to introduce you to my nonfiction book, The Survival Bible: 16 Life Lessons for Young Black Men. I’m not expecting you to choose it as a book club selection (although that would be nice), but I’m hoping that as mothers, educators, community leaders, and someone who cares about the future of young people, you will help spread the word to someone you think might benefit from the book, especially in light of all the craziness going on with our young Black men. There are very few books aimed at young black men, and even fewer written by someone who has seen the ugly side of walking the wrong path. I’m lucky that I lived to tell about my life in the streets. I’m even luckier that I learned some valuable lessons from my journey and it’s now my hope to spread those lessons to young black men across the county. Just a little bit about me…I am the author of five socially-conscious, thought-provoking, novels, including Baby Girl, Riding Rhythm, MVP, PreacherMan Blues and Wild Cherry. 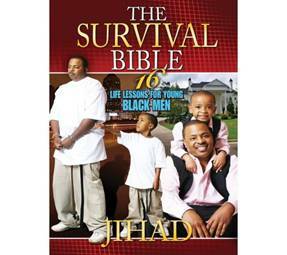 A single father who resides in Atlanta, I am most proud of my latest book, The Survival Bible: 16 Life Lessons for Young Black Men. You can find out more about me at my website at http://www.jihadwrites.com. You can order the book directly from my website and I do offer special discounts to school, churches and community organizations. Or you can order at Amazon.com and give as gifts to the community. Please help me spread the word to others – male and female – who can make our young black men aware of this book! As always, I appreciate all that you do for African-American authors. Black Men Where Are You?! by Brenda HamptonBy now, I’m sure that many of you have heard about the recent beating of the teenager in Chicago, many have seen the school bus incident where two Black teenage students attacked a white student, and just last night in my hometown, another 16 year old was gunned down by his peers. This is happening everywhere, and unless we begin to address the real reasons as to why this is happening, more of our children will be killed. Just think, what if something like what happened to Derrion Albert happened to your sons or daughters? I’ve thought about it, and the thought pains me. I can’t even imagine what the mothers and fathers go through after losing their children, but after watching the video of Derrion Albert being beat, I can’t rest peacefully and I’m literally sick to my stomach. I can’t stop thinking about how anyone can cause such harm to another person. What’s going on with you, where you feel proud about stomping someone to death or bashing their head in? Right now, I won’t even comment on what I feel for those who were arrested, but I will tell you that I have very little remorse for them. Maybe I should feel sorry for them too, after all, they were taught how to approach life by their mothers, or maybe…fathers? By the way, Dad, where are you? Your sons NEED you! Don’t you get it? They…we are all crying out for your help! Mom just can’t do it alone anymore, and even though many women do a great job raising their children as single parents, obviously, some women don’t! Either way, Dad, when are you going to take responsibility for bringing a human being into this world? You just can’t walk away and think that your kids do not need you. Your daughters NEED you too, and every time she searches for love in the wrong place, she’s really looking for you. Your sons…oh, my God, please help your sons! Go get them from our streets, and stop them from killing each other. Stop them from overcrowding our prisons and being made examples of. Let them know there’s a sensible way to approach life. Put your arms around them and tell them that you’re sorry for abandoning them. Tell them that you love them, that you’re proud of them and that you’re willing to do whatever it takes to make their lives better. Don’t wait for another man, a mentor, the president, or any other male figure to do it. Think about it…he’s got your blood running through his body, and he will carry on the legacy that you taught him. Have you asked yourself what you want your legacy to be? Please, give him a chance that you are failing to give him. Wherever your children may be, find them. Connect with them, talk to them, be there for them, please! There is no other way for anyone to correct what is going on, if you do not make an effort to do your part. What we’re watching play out in the streets of our cities are the results of continuous neglect from parents, particularly fathers. Now is the time, and we can’t afford to wait another hour, day or years for certain individuals to step up. The mission starts with you and you know who you are. Close the doors to your weak ways of thinking and realize how much difference it would make if you gave your children the time they truly deserve. I know change isn’t easy, and it brings about many challenges. Set aside your fears, and to prevent us from losing more of our precious children, please, Black men especially, do the right thing. Because at the end of the day, Derrion Albert and all of the other innocent children who have lost their lives didn’t deserve to be taken away from us by the young men some of us are creating. If any of these children belong to you, think about their futures, your future, and the future you could have allowed Derrion Albert to have, had you been there for your child. Remember, it’s not too late to make sure this doesn’t happen to another innocent victim. Spread the word and help me get this message to resonate. As always, I welcome your feedback and can be reached at brendahampton_1@netzero.net Readers, please share your comments or suggestions here. Why Don’t African-Americans Go to Therapy? There are many different ideas about why we don’t seek therapy. Some believe that it is only for wealthy, White people, others believe that you don’t go outside the family with your problems. Some of these thoughts keep us struggling more than we need to. Here are some of the more prevalent ones. Many of us think you have to be “touched” or “crazy” to go to therapy.” While it’s true that some people with mental health issues seek therapy, it’s really a service for anyone. Therapy is a paid service that connects you with a trained professional who provides you with the support you need to live a healthier and happier life. When I first met “Andre” he was apprehensive about seeking therapy. For many months, he questioned whether or not he should be in therapy. Overall, he felt that his life was manageable and that he did not have enough problems to go to therapy, after all he had a job and people who cared about him. He certainly was not “crazy”. After several discussions about the purpose of therapy and its benefits to him as a rationale person, Andre accepted his desire for therapy. In fact, in a recent session Andre said that the healthiest people he knows are all in therapy. He realizes that therapy is a place that can benefit everyone, not just a small segment of the population. Andre further explained that the people he knows who have the most problems aren’t in therapy. Of course, as a therapist, this makes perfect sense to me. Recognizing that your life is not how you want it to be or that you need additional support takes a lot of courage and self-reflection. These are not the thoughts of a “crazy” person. Rather, this is the thought process of someone who has a sense of who they are and wants more from their life and themselves. Why do you need to go outside of your family/church/friendship circle to get the help and support you want? Sometimes, you don’t. But sometimes, going outside of that comfortable and familiar circle will propel you to make the changes that you want to. When people talk with their family or friends, many times they don’t tell them everything that’s going on in their head or in their lives. This isn’t to be deceptive, but because you care about your family and friends and you care what they think about you. Keisha came to see me because she was thinking about leaving her husband. She recently found out that he had an affair. Her family adored her husband and she was afraid of what they would say. She hadn’t made up her mind about leaving, but she needed someone to talk to, someone who wouldn’t immediately tell her what to do, whether that meant leaving or staying. When you’re concerned with what the other person is thinking and feeling, you cannot focus on yourself and your own needs 100%. That’s the benefit of therapy. You can share all of your thoughts and feelings without being concerned about the therapist. In doing this, you can focus on you, what you need, what you want, and ways to accomplish that. Sometimes people are more honest when they go outside their circle of family and friends. As backwards as it may sound, it can be easier to talk to a stranger, easier to share your feelings, fears and pleasures with someone who you do not see everyday. Keisha was relieved to talk about her marriage, what her husband did wrong and what she did wrong with someone who did not judge her or tell her what to do. This freedom allowed her to be honest with herself and decide what she believed to be best for her. Ultimately, she decided to stay and work on her marriage. Keisha said that she was glad that she used therapy to help her sort this out. Had she gone to a friend, they might have told her to leave “that no good . . . .” And her family may have told her to stay in the marriage, to stick it out “for better or worse”. Keisha realized that she needed to come to her decision on her own, not to be told by others what to do. Does this mean that your family and friends aren’t helpful to you? Absolutely not. Instead, it means that therapy can add to the support that they provide, by giving you support in a very different way. Therapy can provide you with an objective person who can help you review your options as you decide what is best for you. As African-Americans, we are aware of the persistent racism in our country. This is true on a large scale as well as in our daily interactions. We have many reasons to be suspicious of outsiders, to be distrustful of their motivations and actions. The Tuskegee Syphilis Experiment is a perfect example of why we are wary of outsiders. Our schools consistently peg our children as aggressive, out of control, and low achieving. We have to fight to receive the same service as our White counterparts, whether it’s in our schools, hospitals or office. Going to therapy poses another opportunity to encounter racism and discrimination if you’re met with an insensitive or ignorant therapist. When I worked in an agency, I often saw African-American clients who said in the first session, “I’m so relieved that you’re Black.” Some said that they felt more comfortable with an African-American therapist because they could talk about life and their culture without having to teach or explain the basics. Others did not like the racism they encountered with White therapists. “Ayanna”, an African-American woman in her 30’s with two children, previously met with a White therapist before coming to see me. She was put off when the therapist began asking questions. The therapist wanted to know about her educational history and was surprised when Ayanna said that she went to college. She then asked how many years of college Ayanna completed, rather than assuming that Ayanna had a college degree, as she does. When the therapist asked about Ayanna’s children and family, she asked if the children had the same father and where was he? At this point Ayanna knew that she wouldn’t be comfortable with a therapist who assumed that she was not formally educated and had children with different men simply because she is African-American. Why African-Americans can benefit from therapy? “So why bother?” With all of the struggles and oppressions that we face on a daily basis we need an outlet. We need a comfortable environment where we can talk about the impact oppression has on us and talk about healthy and productive ways to deal with it. Holding in the pain, frustration, anger, and sadness eats at you, leaving you feeling angry and dissatisfied, not a rewarding way to go through life. When you find an effective therapist, therapy can be a place to gain support and find more satisfying ways to live life. It is the one place, perhaps the only place, where you don’t have to have all of the answers and you don’t have to worry about the person sitting across from you. It is a place where you only have to worry about yourself and your needs. Therapy provides an objective perspective from a trained professional. The therapist’s objectivity comes from not having a personal relationship with you. The therapist knows you now, as you are, not as you were. They can provide feedback based on what they see now, not based on how you used to be. Although our family and friends may love us and provide us with support, they cannot be objective like an outsider. Unlike personal relationships, a therapist has no ulterior motives; the only motive is to make the changes in your life that you decide to make. How can African-Americans find a therapist? First, figure out what is important to you. Do you care what race your therapist is? What about gender? If you think that seeing an African-American therapist is necessary for you to be open and honest with them, then look for that. If you’re not sure, then try a few different therapists out and see what feels right to you. Also, don’t be afraid to ask for what you want. Remember, this is a service that you’re paying for; you are the client. As a paying customer, you have the right to ask for what you want. From there, the therapist can tell you if they are able to provide that service. If they cannot, ask them to give you referrals until you find what you’re looking for. Before scheduling an initial session, determine the therapist’s fee and make sure that you can afford it. Therapy is a useful tool that helps people in times of crisis and fosters growth in times of reflection. However, it is not as useful if you are not committed to it. So make sure that you can afford the therapist you choose. If you have to alter your budget to afford it that’s fine; if it obliterates your budget then look for someone with a lower fee. If you have to cut out dining out 3 times a week or paying for your morning coffees, that’s altering your budget. If you cannot afford to pay your rent/mortgage, that’s obliterating your budget. Finally, don’t forget what you already know. You get what you pay for. Do higher prices mean better service? Not necessarily, but a quality and effective therapist will charge within the average range for the area. When you’re ready to enhance your life or get help with a current crisis, a therapist might be just the one to call. 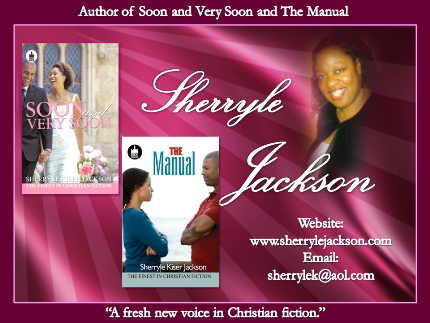 The second novel, The Manual from author, Sherryle Jackson who brought you Soon and Very Soon will be released in October 2009. With a chance to confront their past with the hindsight of adulthood, The Manual, takes a realistic look into the lives of two unequally-yoked high school sweethearts who must forgive and forget to raise their teenaged son. Follow the author as she chronicles the journey from conception to the printed page. — December 5, 2009 Area-Wide book discussion at 7-9pm. It will be at the picturesque Village Commons Community Center in Crofton MD. Authors Pavilion at Virginia Center Commons Mall, Richmond VA.
Young, Black, and Gifted Journalists! Need a manual on raising children and having healthy relationships? Refer to the Bible. That’s what Deidre Collins’ inner spirit is telling her to do now that Andre, her son’s father, is back in town after deserting them eight years ago. At fourteen years old, her son, DeAndre, is struggling with his own issues-peer pressure, problems at school, and figuring out how to navigate his first crush. When DeAndre gets suspended from school for ten days, Andre sees it as the perfect opportunity to get to know his son-and to get closer to Deidre. Can this couple overcome the past for the sake of their son’s future? Sherryle Kiser Jackson is a child of God seeking to edify the world. She is blessed to be a educator, wife and mother of two (One girl, one boy). Sherryle Kiser Jackson strives to be a fresh voice in Christian fiction. Her writing style reflects a honest commentary on her personal life with Christ. Soon and Very Soon was her debut novel, which is a Black Christian Book Distributor’s Best Seller. Her second novel, a Urban Christian title, The Manual, is slated for release in October 2009.